Melbourne has a reputation as a city with intriguing laneways. Bars, clubs, cafes, restaurants and galleries are situated in these laneways, but many of them don’t have any signage or street address and unless you know how to find them through word-of-mouth or social media, you won’t know that they are there. Finding the place is part of the fun. Street art has added another dimension to the vibrancy of some of these hidden laneways. 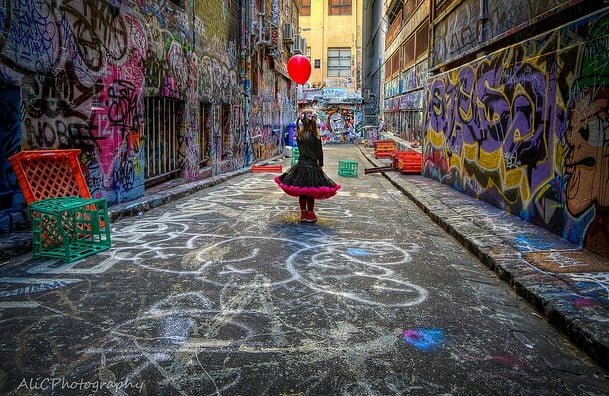 Melbourne has now become not only the street art capital of Australia, but also one of the most significant destinations in the world for street art. Internationally-knownstreet artists such as Banksy (England) and Swoon (USA) have come to Melbourne for the express purpose of painting in the laneways. Local artists such as Phibs, Rone, HaHa and others have built respected reputations here for their laneway work. Collectors and auction houses are showing increasing interest and recognize street art as a contemporary art movement. And works by the artists are fetching high prices and growing in value. Until a few years ago, these narrow alleys used to be neglected, dark and dirty places. Cobbled in bluestone, some had a decidedly 19th Century feel to them. They were the hidden face of Melbourne. They ran parallel to its beautiful wide, open boulevards and connected them discreetly. Some laneways, like Flinders Lane which housed the factories of the rag trade for over a century, were part of the lifeblood of the city. But they weren’t the respectable, showy part of it. No longer. Now richly imaginative and vividly coloured paintings, stencils, designs, messages and motifs have transformed many of them. The laneways are finding a new life and adding excitement to the city, drawing locals and tourists alike to enjoy their flamboyance and energy. Some of the most colourful street art is in Hosier Lane. Join a tour or go by yourself. End your tour with some great coffee in the many cafes along the laneways. Take a look at the slideshow of street art in Melbourne’s laneways. Wow! Undoubtedly the best street art ever! Thanks so much for the tour and the map! Thanks, we’re glad you liked it. As part of a new art project, the City of Melbourne painted over these images to enable new street artists to have a chance. We captured a moment. Enjoyed seeing your video and really like your art.